As widely expected, the trade balance swung to a surplus in September after two consecutive months of deficits. However, the $487m surplus was much smaller than the $1.8bn consensus estimate. This resulted from a sharp swing in growth of both exports and imports . The 5.2% year-on-year export contraction was a reversal of 6.7% growth in August, the first negative print since early 2017. But import growth also slowed sharply to 9.9% from 22.8% over the same months. The Thai Commerce Ministry attributed weak export performance to a high base effect, the US-China trade tensions, and problems in some emerging markets. Data clearly undermines the Ministry’s expectations of sustained export growth in 2019 projected at 8% on the back of strong demand from China and ASEAN countries. The base effect is indeed active in driving the export growth everywhere else in the region. But it seems the impact of the US-China trade tensions has yet to kick in. At least it wasn’t reflected in China’s strong export growth in September. The escalation of the US-China trade tensions will remain an ongoing threat to exports in the period ahead. But on a positive note, it could also open the opportunity for increased intra-regional trade to bypass tariff barriers. 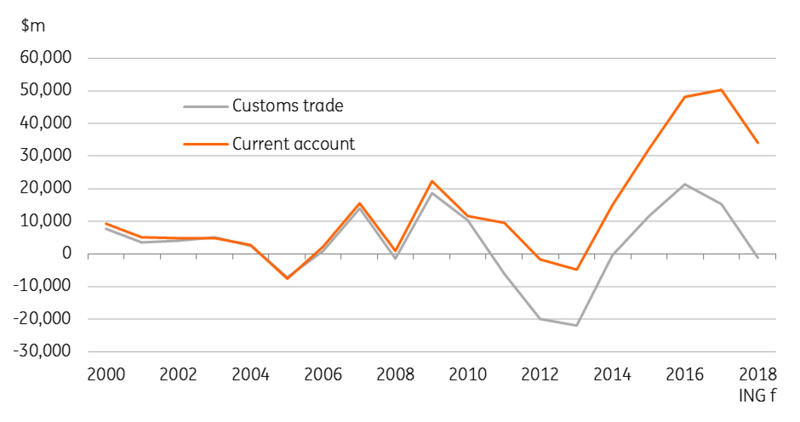 At $2.8bn, the cumulative trade surplus in the first nine months of this year was $10.4bn narrower than a year ago. At this rate, the full-year 2018 trade balance could be in deficit to the order of $1bn against over $15bn of surplus in 2017. Absent any offset from services income this will certainly drag the current account surplus lower. Indeed, the tourism income has already started to take a beating from slowing Chinese tourist arrivals in recent months. The current account posted over 11% of GDP equivalent surplus in the last two year. Our forecast has it narrowing to 7% this year, with the risk biased to the downside. It's still large compared to other Asian economies, which is what lies behind Thai baht's (THB) ongoing outperformance among Asian currencies this year. We maintain our end-2018 USD/THB forecast of 33.0 (spot 32.6). Trump’s secret: What would count as a ‘win’ for him?